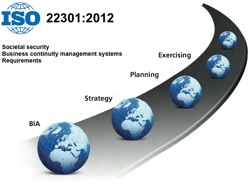 The requirements specified in ISO 22301:2012 are generic and intended to be applicable to all organizations or parts thereof, regardless of type, size and nature of the organization. The extent of application of these requirements depends on the organization’s operating environment and complexity. First standard to be written using the new high level structure, which is common to all new management systems standards. This will make integration straightforward when implementing more than one management system. Change in the way an organization is defined. Preventive action has been replaced with “actions to address risks and opportunities” and features earlier. ISO 22301 puts a much greater emphasis on setting the objectives, monitoring performance and metrics – aligning BC to top management strategic thinking. Take a proactive approach to minimizing the impact of incidents. Demonstrate resilience to customers, suppliers and for tender requests.